In February 1967, a one-off television drama in the series Armchair Theatre introduced the surly, complex and ferociously downbeat character of David Callan – a professional hit-man working for a very dirty section of British Intelligence. As portrayed by actor Edward Woodward, Callan was to become an iconic figure of espionage fiction, appearing in novels, a film and an immensely popular television series (1967-72) which has recently been reissued on DVD. 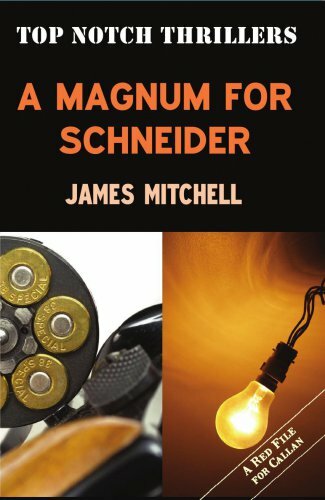 Callan’s creator, screenwriter James Mitchell, adapted his play A Magnum for Schneider as the first of five novels to feature his human, but not necessarily pleasant, hero. It was later issued as Red File for Callan but is now back in print under its original title for the first time in over 40 years.